(UPDATE) A ticket to this week’s Major Legaue Baseball All-Star Game won’t be cheap. According to data from TicketIQ.com, the average asking price on the secondary market for both the Home Run Derby (Monday) and All-Star Game at Washington’s Nationals Park (Tuesday), are the highest of the last five years. The current average asking price for the ASG is $869 with a get-in price of $315, and the current average asking price for the Home Run Derby is $537, with a get-in price of $185. The ASG asking price ranks ahead of the 2015 game at Great American Ballpark, which had a previous high asking price of $857. The next three in order were: $747 at Petco Park in 2016, $715 at Target Field in 2014, and $465 last year at Marlins Park. The 2015 game featured Clayton Kershaw, the Cy Young winner in 2013 and 2014, starting on the mound for the National League. This year’s Home Run Derby, which features hometown favorite slugger Bryce Harper, has the highest average asking price by a mile. The next closest in the last five years was $417 at Minnesota’s Target Field in 2014 when hometown favorite Brian Dozier joined a roster that included such well-known sluggers as Yoenis Cespedes, Jose Bautista, Giancarlo Stanton and Troy Tulowitzki. The record asking prices are even more remarkable given that, according to TicketIQ.com, there has been a 9.7 percent drop in the Home Run Derby's average price and 6.4 percent drop to the All-Star Game's average asking price over the past week. Nationals Park will host the All-Star Game for the first time in its history, and the game will be in the nation’s capital for the first time since 1969, when the Washington Senators hosted. The American League and National League have traditionally been well-matched, as the teams have a series record of 43-43-2, though the AL has won the last five games. The game no longer determines which league will get home-field advantage in the World Series. Nationals Park will host its first Major League Baseball All-Star Game and the first since 1969 in the city of Washington, D.C. on July 17. And demand reflects the city’s enthusiasm for bringing baseball’s star-studded annual event to the nation’s capital. 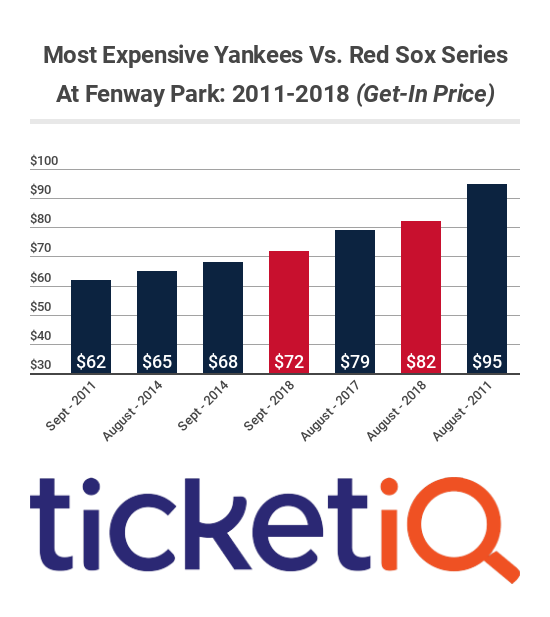 According to TicketIQ.com, the average asking price for a ticket to the game at Nationals Park is $872 on the secondary market, making it the second highest average asking price since TicketIQ began tracking data for the event in 2010. The most expensive ticket was $883, for a seat at New York’s Citi Field in 2013. The cost of a ticket to the All-Star game on the secondary market has only broken through the $800 barrier two other times this decade – in 2012 when fans paid an average of $864 at Kansas City’s Kauffman Stadium and in 2015 when fans paid an average of $858 at Cincinnati’s Great American Ballpark. The cheapest ASG ticket of the decade on the secondary market was $351 in 2011 at Arizona’s Chase Field. The get-in price of $295 for next month’s game is among the highest since 2010, as well. Fans only paid more in 2015, when the get-in price was $315 at Great America Ballpark. Fans interested in a chance to see the best in the game launch home runs can buy a separate ticket for the Home Run Derby, which will be July 16. Among the players expected to participate in the Derby this year are New York Yankees’ sluggers Aaron Judge and Giancarlo Stanton as well as Minnesota Twin Miguel Sano. The current average asking price for a ticket to the Derby is $402, making it the third most expensive of the decade on the secondary market. The priciest Home Run Derby was at Kauffman Stadium, when fans paid an average of $499, to see Prince Fielder win with 12 dingers in the second round to tie Robinson Cano’s record set in 2011. The only other time Derby tickets broke the $400 barrier this decade was 2014, when the average asking price settled at $418 at Minnesota’s Target Field. When it comes to overall sporting events in Washington DC, this year's All-Star game is the 5th most expensive in DC this decade. No one should ever miss the best rivalry in all of sports, the Boston Red Sox vs. the New York Yankees.